Everyone loves flowers, even those who suffer from pollen alergies can still admire the beauty and charm of flowers no matter how much they make their eyes water. I adore flowers of all types though I have to admit I have never been a fan of the artificial flower. In the old days these used to be nasty plasticy things, and although nowadays you can buy the most amazingly real looking artificial flowers they still hold on to a little bit of that fake flower stigma. Fabric flowers on the other hand aren’t pretending to be real. They have crafted beauty and charm in their own right. 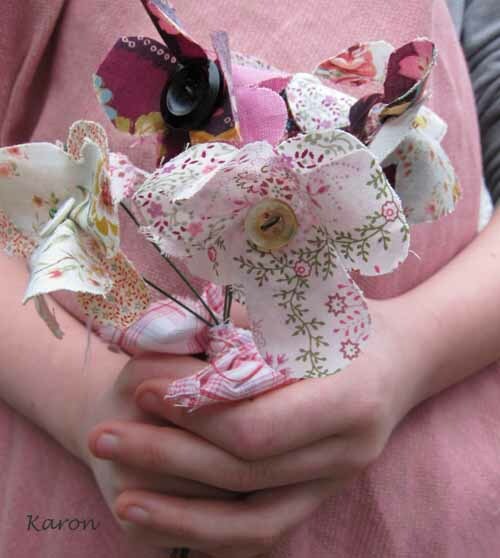 In my crafting days I used to make rather a lot of fabric flowers. I made hundreds (no, thousands) of these flowers and sell them on my site, at fairs and I even supplied the prestigeous Liberty’s of London store with them. They are simple to make so I thought I would share them with you here. 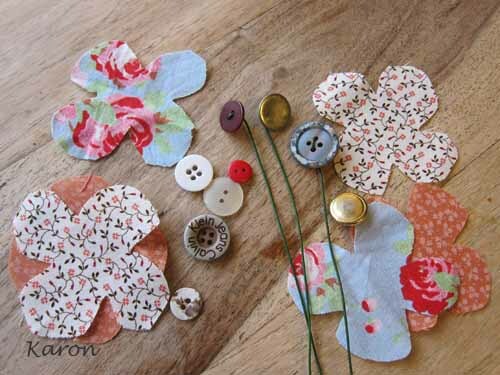 Cut out several four petal flower shapes. You are best to make a cardboard template for this and just draw round it. Thread the wire on to the button and twist at the back to secure. Place two flower shapes on top of eachother and make sure they are aren’t directly on top, but slightly to the side of eachother. Poke a hole through the crentes and thread through your green wire with button at the end. Thread your needle with strong thread and take a few stitches in and out of the flower centre and around the wire this will pinch the flower and give it shape as well as securing it to the wire and button. Make a whole bunch and sprinkle with essential oils for a fabulous scent. Wind the wires round door handles and curtain poles. Make your everlasting flowers part of your everyday life. 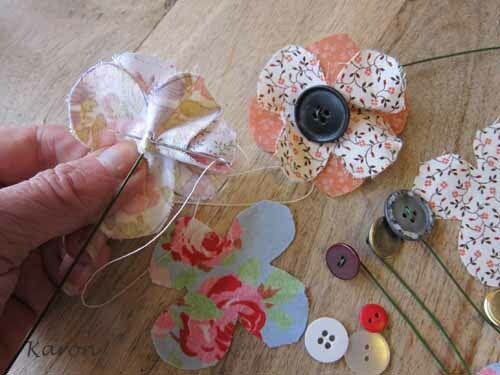 So this is my way of how to make fabric flowers, they are simple and easy and a lot of fun too! Would really love to have a bash at making refab flowers as I have loads of scrap material, I am rubbish at cutting out do you happen to have a template for petal shapes.